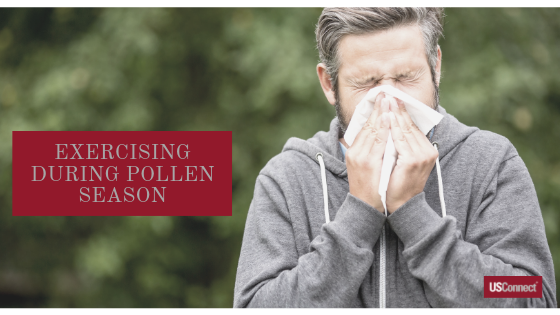 If you are one of the many people who loves staying active outdoors, but you suffer from seasonal allergies, then you may find yourself becoming a lot more sedentary when spring arrives. Skipping out on these activities may help keep your allergies under control but becoming a “couch potato” is not the answer. Keep active by staying informed, changing your routine, and utilizing these strategies that will keep your body in motion and your energy at peak. First you need to keep track of the pollen counts in your area. If you know which allergens you are sensitive to, that is even better. Many local news stations will tell you whether weed, tree, or grass pollens are expected to be higher than usual, and this can help you prepare. Another fast way to check pollen counts is online. Websites, such as the American Academy of Allergy, Asthma, and Immunology keep national pollen counts. You can check your local counts by clicking here. Typically pollen counts will begin to rise in the morning and peak at midday, gradually falling toward evening. Generally, the lowest pollen count will be early in the morning before sunrise and late in the afternoon to early evening. However, if the pollen count is very high or if it is a windy day, pollen counts may remain elevated longer than usual. It is also normal in urban areas for the counts to peak and fall later than in the suburbs. Try to schedule your exercise to avoid the peak times of high pollen counts. The best time to get out is right after a good rainfall which washes a lot of the pollen out of the air and greatly reduces the pollen count. While outside, sunglasses can help protect your eyes not only from the sun, but also from pollen. Dab some Vaseline® around the edge of each of your nostrils before going out. This helps block pollen but be sure to reapply if you blow your nose. Covering your nose and mouth with a mask will really help minimize your inhalation of pollen when counts are high. If you usually exercise outside, consider trying a different venue for high pollen count days. There are many exciting and enjoyable opportunities such as indoor mountain climbing, indoor skiing, and even indoor sky diving. A little less extreme option, but one that is easy and inexpensive is heading to a local indoor pool. Did you know that exercising in water is a great way to strengthen muscles? Water offers natural resistance that provides a more intense workout and increases the benefits of strengthening and toning. Even if you are not a swimmer, just walking, doing water aerobics, or dancing in the water offers great benefits. Many gyms and YMCAs offer the use of pools among their amenities for members, and city pools usually have a low entry fee for city residents. In addition, Dr. Jay M. Portnoy, Division Director of Allergy, Asthma, and Immunology at Children’s Mercy Hospitals in Kansas City says, “Allergies trigger asthma, making it much more difficult to exercise. It’s recommended that people with asthma take up swimming as an aerobic activity. The reason exercise makes asthma worse is because the airways dry out and get cold when you’re breathing fast. If you’re swimming instead of running outdoors, then there’s more moisture and warmth so you’re less likely to have trouble breathing.” Going to an indoor pool is a great way to avoid that pollen without skipping your exercise. If walking or running is your thing, think “inside” the box. Many cities now have totally enclosed walking paths stretching for miles that can be an excellent way to get your exercise without subjecting yourself to pollen. If your city does not have an enclosed skywalk or underground pedestrian system, check with your local parks and recreation department as well as local fitness centers to see if there is an indoor walking track available. If not, consider walking through an indoor shopping mall or museum. Some cities have large airports that are fun to walk through as well. Perhaps you prefer to avoid going outside altogether during pollen season. You can still get some great exercise right at home. If you own a treadmill or stationary bike, that would be an obvious first choice. However, for those of you who do not own any exercise equipment, why not try an exercise video? You can rent them at the library or find them available online. Amazon Prime and YouTube both have many fitness workout videos available for different fitness levels. Whatever option you choose, it will definitely be better than skipping your exercise entirely. Track the pollen counts, strategize your timing, use barriers, and consider alternative venues for your exercise. You can avoid the pollen and still find different fun ways to stay fit!